I have been asked many times that what is the area required for a solar array with a particular rating (such as 20 KW) and I have given a simple calculation method in one of my earlier post. But real life is never so simple. There are a bunch of inputs that we need to get an exact answer. In particular we want to know what is the required spacing between solar panels so that they are not in shade for a particular part of the day (typically 5 or 6 hours) and for this we need a number of inputs such as latitude, longitude, solar noon on the worst day of the year etc. Here we show the sequence of calculations for a typical city in Northern India. Similar calculations would hold true for many cities in Pakistan as well. Let us first list down the data we have for New Dehli a typical city in Northern India (this data is available on ESRL website). Now we are ready to calculate the distance between the panels. 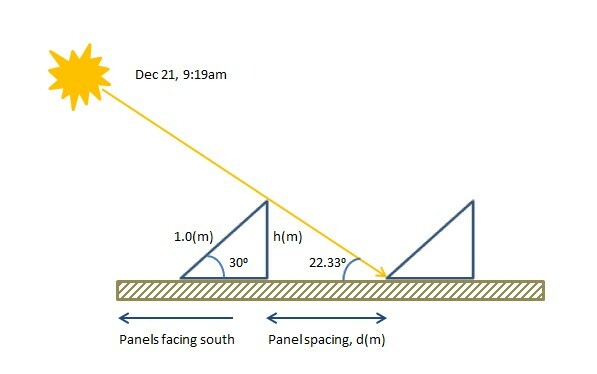 So for a 1.0 m length panel we need to have a separation of about 0.87 m between the panels along the north-south line (panels facing south in the Northern hemisphere). To be on the safe side we can keep the distance a bit higher than this. We can estimate that the total area would be increased by a factor 2.0 (0.87 m is the separation of the panels and 0.87 m is the base of the triangle formed by the inclined solar panel) or we can simply multiply the area calculated by the simple calculations (for a panel lying flat on the ground) given in the earlier post by a factor of 1.74. Note: These calculations are valid for solar panels placed on the ground, in straight lines, along the east-west line (facing south). For panels placed on inclined rooftops the calculations would be different (area required would be generally lower). Also note that solar panels are highly sensitive to shading and even if only 10% of the panel is in shade its performance without deteriorate appreciably. Lastly some installations have different panel tilts for winter and summer (latitude +/- 15 degrees) and this needs to be catered in the calculations. But is the panels are at an inclination on flat ground you may need about twice that area (120m2).